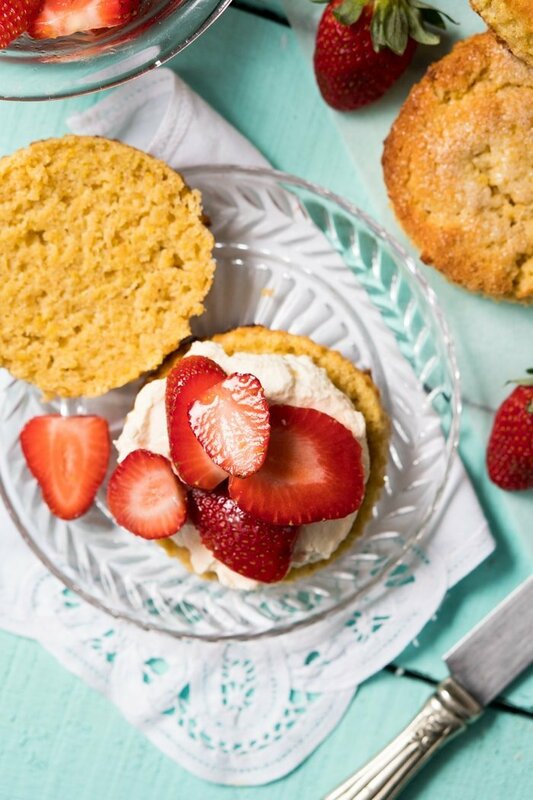 These keto strawberry shortcake are tender, moist, and with beautiful orange notes throughout! Simply summer at its best! 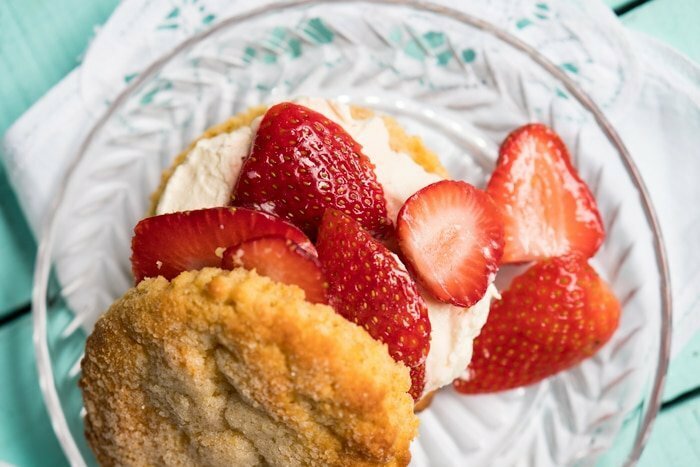 Let me tell you a little story about these low carb strawberry shortcake. I was doing a bit of testing one weekend for gnom-gnom’s Keto Summer Favorites eCookbook, and in comes Friend #1. He tries these guys and casually states how they’re “fairly incredible, wow!” And 30 minutes later in comes Friend #2 to join us for lunch, and once we get around to dessert you can probably guess what she said. Yup, these are fairly incredible! Tender, buttery, moist and with beautiful hints of orange throughout. You can technically go for lemon too, but I really have a sweet spot for the former. So yes, this is one of the brand new recipes from our special summer edition. And if you took notice, I gave you guys a sneak peek back on Sunday; publishing it’s recipe card from the book during it’s release. And guess what?! One of you guys already whipped these up and reported on the gram that they’re (quote) “simply fabulous“. Fact is, I’ve been immensely surprised by all the recipes you guys are already whipping up from the book in just 3 days. What a treat, thank you! Easy-peasy really, and easiest done in your food processor. You simply pulse the flours together, add the butter and pulse until pea-sized, mix in the liquids, and cut-out onto a baking tray. Almond flour. 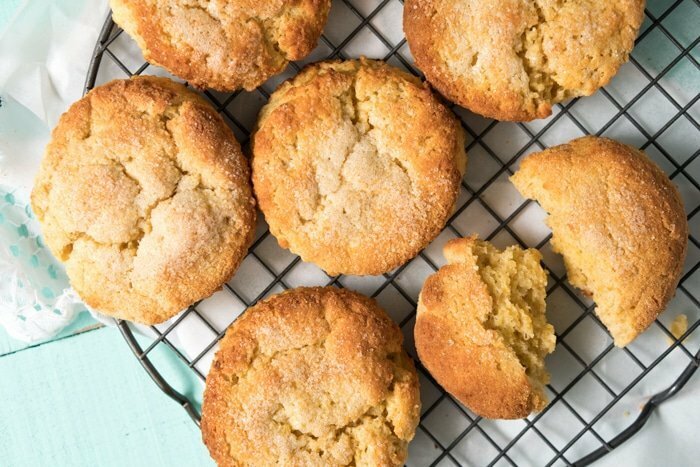 You truly need a super finely ground almond flour here, as if you use meal your shortcake will turn out dense and oily. Super fine almond flour brands include Anthony’s (my favorite), WellBees and Bob’s. Flaxseed meal. You’ll want to use golden flaxseed meal (I use Bob’s), and regrind the flakes in your (very dry!) bullet or blender until finely powdered. Great way to avoid slimy breads. If intolerant to flax, you can use finely ground psyllium husk (absolutely must let them cool completely before cutting!). Coconut flour. I always favor Anthony’s (best taste and texture), but Bob’s works great too. Whey protein isolate. This one helps to get a fluffier and lighter texture. Keep in mind that this ingredient varies tremendously from brand to brand, and we’ve only tried (and are super happy!) with Isopure’s Zero Carb Unflavored. You can substitute it with more almond flour, just keep in mind your shortcake will be a tad denser. These keto strawberry shortcake work well with erythritol (Lakanto is my favorite), xylitol (non-corn though to avoid tummy troubles!) and allulose are my top choices (no aftertaste!). And if paleo (or not restricted by sugar), coconut sugar is your best bet here. So you’ve got options. Mix the strawberries with a bit of orange juice and sweetener (optional). Allow to macerate while you make the shortcakes. Add egg, sour (or coconut) cream and apple cider vinegar to a medium bowl and whisk for a minute or two until fully mixed. Set aside. Add almond flour, flaxseed meal, coconut flour, whey protein, sweetener, baking powder, xanthan gum (or more flax), kosher salt and orange zest to a food processor and pulse until very thoroughly combined. Pat the dough onto a round in the prepared baking tray, dusting with coconut flour as needed. Cut out six shortcakes, working the dough as little as possible. Brush with melted butter and bake for 15-20 minutes until deep golden. Allow to cool for 10 minutes before serving. Whip up heavy cream (or cold coconut cream) in a chilled bowl until soft peaks form. 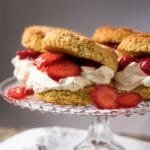 To assemble the shortcakes, halve the biscuits and add a dollop of whipped cream and a generous helping of strawberries. These guys keep well (unassembled! ), stored in an airtight container at room temperature, for 3-4 days. You can freeze the shaped biscuit dough for 1-2 months, and bake straight from the freezer as needed. I found each batch to yield 6 biscuits, and nutrition facts were estimated per biscuit without the strawberries or the cream (so adjust the amount of these to fit your macros. And note that you can also make them a little thinner and get 7-8 out of one batch. 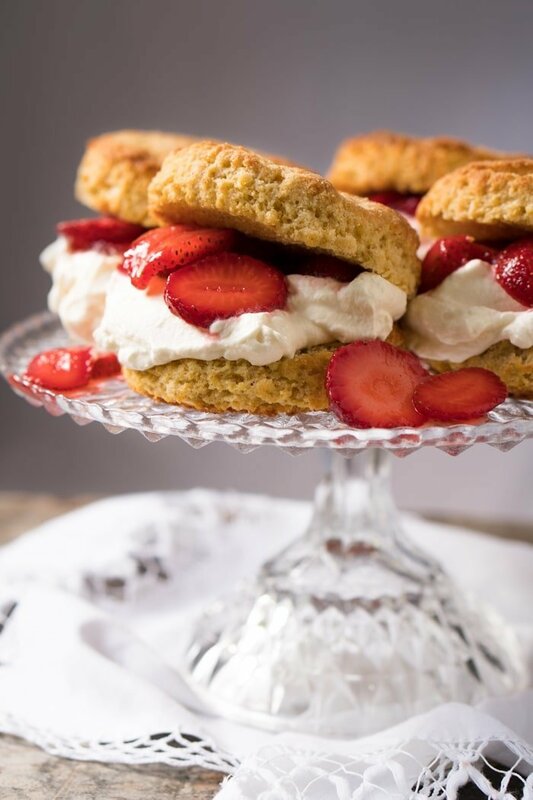 Looking forwaed to making these this Saturdsy, strawberry shortcake is my traditional April birthday dessert. So thank you so much for this recipe!!! For the sweetener, is Swerve okay to use powdered or granular? Either form will work Sophia enjoy! Could you use a collagen protein powder instead of the whey protein? I cannot have whey. Thank you! Honestly Debbie shortcakes (biscuits and scones) are at their absolute best the day they’re baked… but! you can whip them up and freeze them right after baking, or keep them in the fridge for two days and bake them on Sunday xo! Its my absolute pleasure Nina, hope you love! Scroll down the email! 😉 xo! I’m confused Orange Juice has a ton of sugar…so how are these keto? I made these to take as scones on a work trip this week. Doubled the orange zest and had to reduce the temperature to 400C for some reason but they are GREAT! They taste and feel exactly like a whole wheat scone. Way to go on the culinary science! Finally found a keto cook that knows what homemade food should taste like and doesn’t just get super excited over vegetable soup with chicken. (seriously) Thank you! Thank you Lindsay! So awesome to hear you’re enjoying the baked goods so much 🙂 xo! 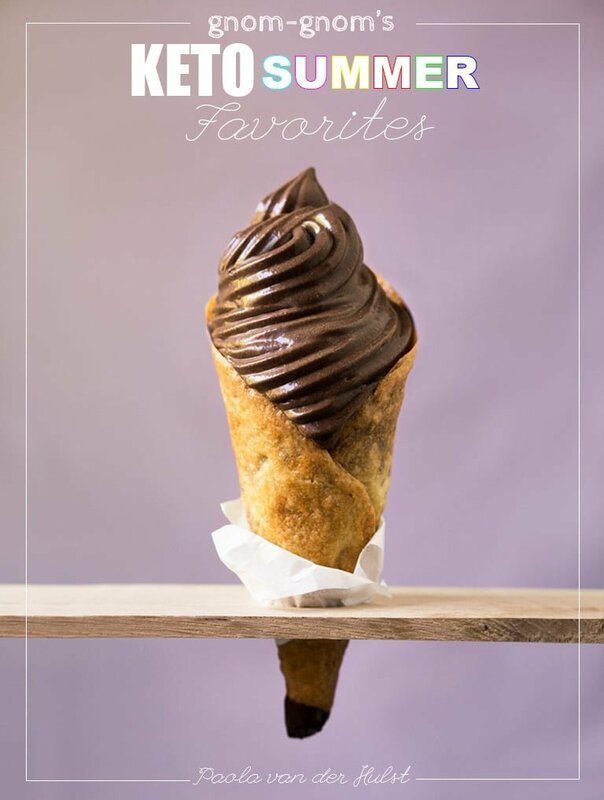 Of all the keto recipes I’ve tried, tortillas, bread, desserts… yours are definitely thee best! HANDS DOWN!!! I love that they’re not eggy. Just delicious. Amazing as always. thank you so much for the great recipe. Thank you Patti! 😉 awesome to see you’re still enjoying the recipes! These were SO delicious! We just enjoyed them for dessert and will be able to have them again for 2 more days! Yay! I had one issue, which I believe occurred due to 2 things (user error no doubt). 1. I put these on parchment, on a flat baking sheet (not rimmed). 2. I may have brushed on too much melted butter before baking. The butter rolled right off the top and down to the bottom of my oven! You should have seen the smoke in my house, LOL! We had to open up all the windows and turn on fans at the doorways! There was smoke pouring from my windows, it had me in such laughter! I’m surprised the neighbors didn’t call the fire department. I’m a seasoned cook and cake baker at that and I have never had anything like that happen. In my “flour” days I always added a lot of butter to my biscuits and baked them on a flat sheet, so I can only assume that the brushing must have done the trick…perhaps it doesn’t soak in as readily to these flours?? I wonder if it needs the brushed butter at all? Perhaps a brushing after I remove from the oven? Your thoughts? enjoying your cookbook so much already paola! These look amazing! Quick question, is the apple cider vinegar used just if you use coconut cream instead of sour cream or is it to be used regardless of which cream? Thanks! Thank you Sarah! You use it regardless (just need to add a little extra with the coconut milk!) xo! Hi! I’m hoping your shortcake will be a lovely scone type deal that I can play with! Are the nutritional values including the strawberries and cream or just the cake itself? Thanks! 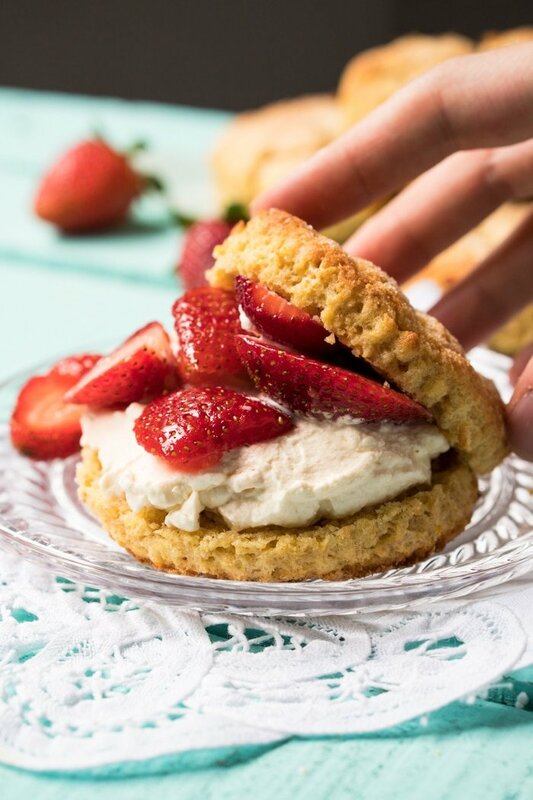 Just for the shortcake Lulu, as in my experience it’s best to leave the values for the strawberries ‘n cream to you guys (when I used to post recipes with the add-ins there were endless commends for ‘just the shortcake/biscuit/etc’. And def work as scones xo! We loved your book so much! These are already programmed for the weekend!